Campaign for the American Reader: Pg. 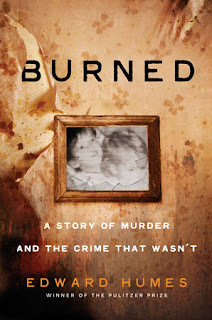 99: Edward Humes's "Burned"
Featured at the Page 99 Test: Burned: A Story of Murder and the Crime That Wasn’t by Edward Humes. On an April night in 1989, Jo Ann Parks survived a house fire that claimed the lives of her three small children. Though the fire at first seemed a tragic accident, investigators soon reported finding evidence proving that Parks had sabotaged wiring, set several fires herself, and even barricade her four-year-old son inside a closet to prevent his escape. Though she insisted she did nothing wrong, Jo Ann parks received a life sentence without parole based on the power of forensic fire science that convincingly proved her guilt. If Parks is exonerated, she could well be the “Patient Zero” in an epidemic of overturned guilty verdicts–but only if she wins. Can prosecutors dredge up enough evidence and roadblocks to make sure Jo Ann Parks dies in prison? No matter how her last-ditch effort for freedom turns out, the scenes of betrayal, ruin, and hope will leave readers longing for justice we can trust. The Page 99 Test: Force of Nature. The Page 99 Test: Garbology. The Page 99 Test: Burned.